"The Sacred Secret of Life"
If you were fortunate enough to see the previous week’s talk, “How You and the Universe Were Made,” you can consider this talk to be part two. 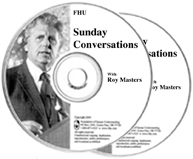 This week, Roy speaks as from a stream of consciousness as he tells the story of life. He answers so many of your “why questions.” What is life? Where does it come from? Why do you have conflict and anxiety? Why suffering? How can you be restored to God? What did Jesus do? Why do we make excuses? Why do you go back to what corrupted you? Roy uses his skills to show you something, so that you might understand.